The McLaren 675LT Spider sold out just weeks after the company confirmed its existence last December, and several months before the public was even able to see the car. The company’s only making 500 of these, and with all of them already spoken for many of McLaren’s clients were left disappointed. So, the Woking, England-based company is giving buyers who missed out another shot with 25 limited edition MSO Carbon Edition 675LT Spiders. Although the “standard” 675LT Spider is built around a carbon fibre tub with carbon fibre body panels, the MSO cars have 40% more carbon fibre components. In fact, at $515,000, the Carbon edition cars carry $140,000 in carbon fibre upgrades — including exposed, matching carbon fibre weave on all external panels. Also carbon fibre are the car’s retractable convertible hard top and tonneau covers. Known for its incredible strength and light weight, carbon fibre has become the material of choice for supercar makers. It was McLaren that really put the material on the map. Thirty five years ago, the company helped pioneer the technology in its championship-winning Formula One cars. And 25 years ago, in its ground-breaking, 240-mph McLaren F1 hypercar. In fact, every McLaren road car every built has featured a carbon fibre chassis. 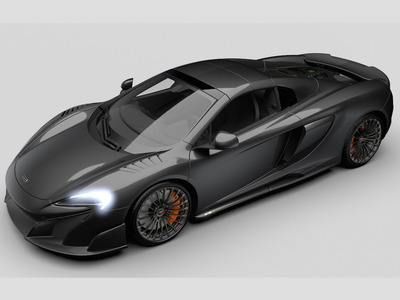 Like all other McLaren 675LTs — LT stands for Long Tail in reference to the company’s legendary Long Tail race cars of the late 90s — the Carbon edition cars are powered by a 3.8 litre, 666 horsepower, twin-turbocharged V8 engine. According to McLaren, the 675LT Spider is good for a 0-62 mph sprint in just 2.9 seconds with a top speed of 203 mph. McLaren expects to begin customer deliveries of the MSO Carbon 675LT Spider by the end of the year.